Our Traditional Style William Baptism Gown for Baby Boys! 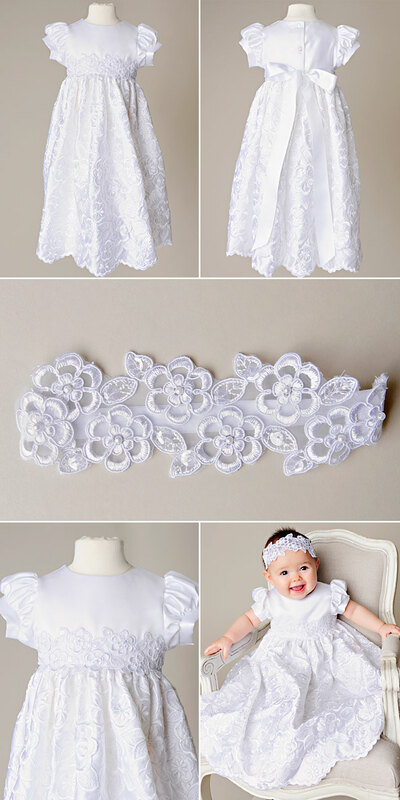 Our latest design in Baptism wear features daisy embroidered satin and hand-beaded daisy lace. From shoulder to hem this dress is approximately 23-24″ (depending on the size). It was designed to brush past baby’s toes, while the included headband wraps her dainty head like a soft crown of flowers. Little ladylike puff sleeves are the perfect starting point for this dress. These sleeves, along with a definitive round neck bodice, are made from pure white satin. Unlike vertical plain weave, satin has a special weaving process. As such, light reflects off diagonally “floating” yarns. Therefore giving off a soft, rich glow! Our satin is a distinct mid-weight fabric. It is therefore universal, not too heavy for summer, yet warm enough for winter events. Hand beaded lace to decorate the waist is just the right amount of embellishment. It is a graceful transitional piece from satin simplicity to elaborate embroidery. Beginning around 900 years ago the life of embroidery on fabric took shape. What started out as artisan intricate artwork on fabric soon became the mark of wealth. It quickly gained favor among the majority and remains sought-after today. In 1820, white embroidery on a white backdrop came to mean fresh-purity and youth. 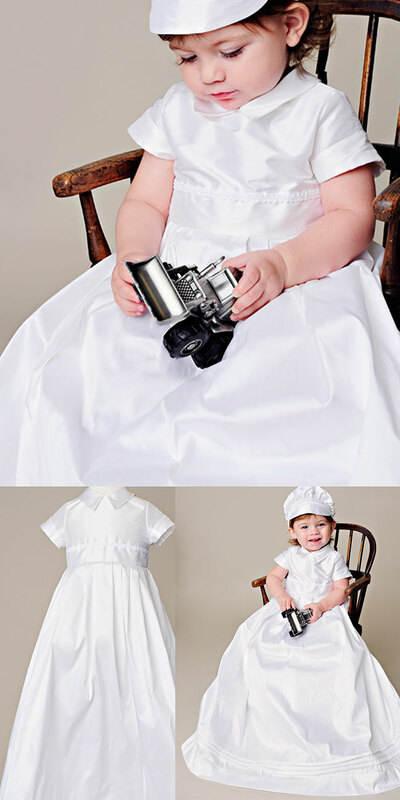 We wanted to bring this same feel to our Arianne Christening Dress. This is where the elaborate details of the skirt come in. Ornate daisies of varying sizes adorn the skirt in the form of exquisite needlepoint. White embroidery on white satin provide princess type quality. In addition, this historic artisan technique offers touch-ably pleasing textile. Finally, graceful scallops make up the hem for a feminine finish. All-in-all, every skirt element combines for a simple, beautiful, time-less dress. This heirloom worthy gown could easily be a link from your little one to future generations. As moms we love to be spoiled by our little ones on Mother’s Day. Breakfast in bed with maybe an eggshell or two, cuddles and a homemade card. But asking for gifts for something we love so very much is not something we do. But what if it was for something sentimental and a keepsake? Perfect for Mother’s Day: Mom and Daughter Pearl Bracelet Sets are a great way to share something sweet and simple with your little girl that will last over time. Then someday, she can pass it down to her little girl. But this gift could also be for a goddaughter, niece or any little girl that is special in your life. They could even be used for a flower girl! The possibilities are endless for something that is timeless and meaningful. I remember those simple gifts over the years at memorable events that really made a difference for me. Things that I want my daughters to be able to see/use and know that I love them so much that I want them to enjoy something that I hold so dear to me. Those small glimpse in their memories will last forever and be a wonderful connection we’ll have through the years, even after they’e grown up. Find the bracelets here for purchase. 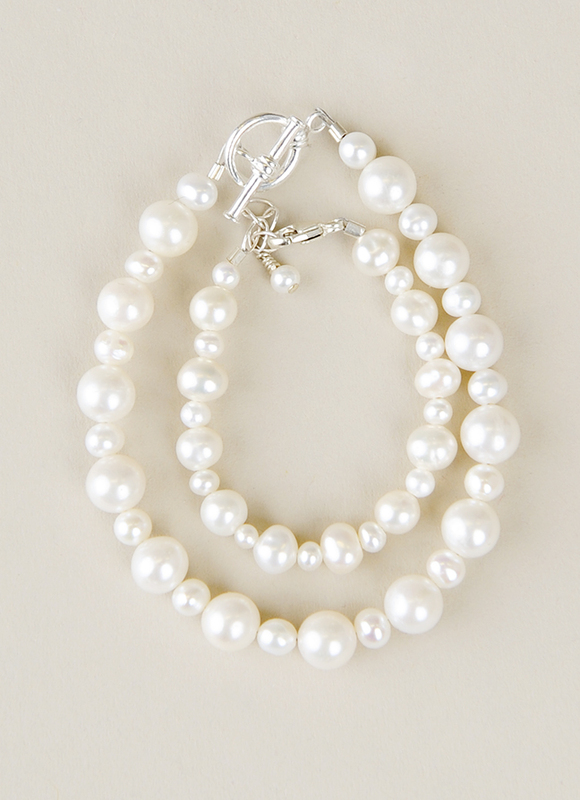 These bracelets are made of fresh water pearls, a sterling silver closure and made right here in the USA. If you have more than one little princess, you have the option to order more to go on everyone’s wrists. If this darling gift is for a Christening or Baptism we offer the ability to attach a cross charm as well. Mom and Daughter Pearl Bracelet Sets are a great start to traditions as well as one to begin even if they are not so little. 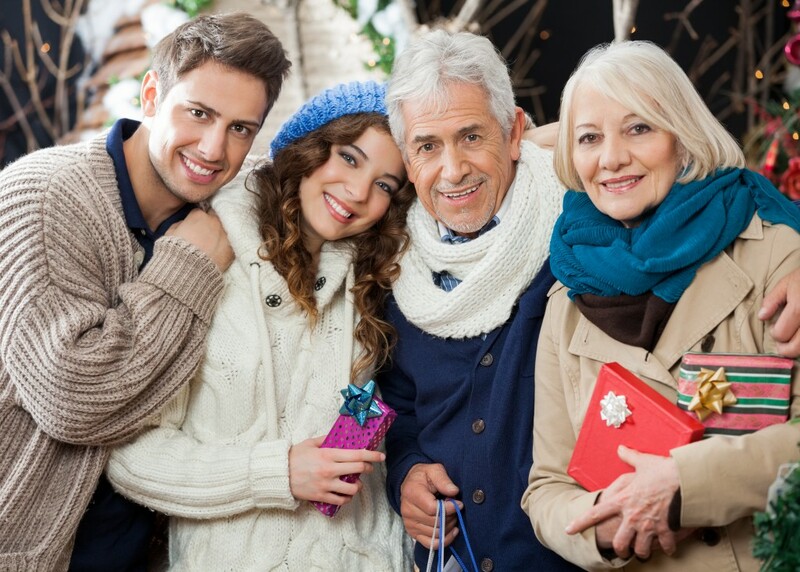 Holidays are a great time to get everyone together and share in family traditions. We love to hear how different families celebrate. So, today we’re sharing some family Easter traditions from a few local moms. 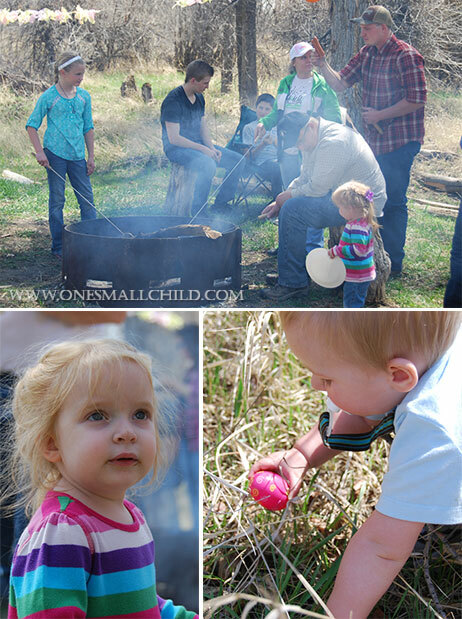 We have a big family and every year we get together on the river bottoms and have a big Easter egg hunt for the kids. The teenagers get to find a bag filled with candy. They love it because they get to feel like they are not a child anymore but they still get the thrill of hunting for something. We always have an open-pit fire so everyone can roast a hot dog for lunch and there is always good food to go with them. Then we get to visit with each other and catch up on what is happening in each of our lives. This is a great time for everyone and the kids especially look forward to it. I like to split the Easter holiday into two days. We try to do the Easter Bunny activities, which include egg hunts, candy and fun activities on Saturday. My favorite thing the Easter bunny gives the littles are a new Sunday church outfit. Maybe a dress shirt for the boys and a dress for the girls. We often are given a book about Christ for the littles to read as well. We reserve Sunday for more religious events. We want Sunday to be Christ-centered. We talk about the Savior and how important He is in our lives and that He rose from the dead that day. This year, I want to try this Easter activity centered on Jesus. Growing up my Mom always made Egg Asparagus Casserole on Easter. She would just use sliced bread, nothing fancy, and dry it out a little in the oven. Then we would have to count all the eggs and make sure we found them all because my Mom made sure that there was a enough for the casserole. If there were cracked eggs the coloring would soak through, and we had multi-colored casserole. For my little family, we stay in Blackfoot for a city hunt and support the activities where we live. I have the fun opportunity to start Easter traditions with my little family this year. My daughter is just over and year and we’re expecting a son just after Easter. I want family traditions to be a big part of their lives, so I’ve put a lot of thought into how we celebrate holidays now. I know my little girl will love hunting for Easter eggs and we’ll probably let her indulge in some treats. I adored the gift baskets the Easter bunny brought to me as a child and plan to carrying on that tradition on as well. I hope to do the egg hunt and bunny basket on the Saturday before Easter Sunday so that we can have a more religious celebration on the Sabbath. I fell in love with this idea from Your Home-based Mom. You read the Easter story from the bible with fun trinkets that help you remember it. I especially love this for little kids. As a child, I always got a new dress to wear to church on Easter Sunday. I loved getting all dressed up in something new. I hope my kids will love these traditions as much as I did when I was a child. Share with us! We’d love to hear your family Easter traditions! Growing up I knew what our St. Patrick’s Day tradition was. There would be green everywhere I turned. Green decor, green milk, green biscuits at dinner and of course green clothes. But something that never happened on St. Patrick’s Day was my mother wearing green. Ever. My mother is half Irish and just so happens to have green eyes. (Being adopted that never was an excuse I could use). She took great pride in trying to keep up Irish traditions even though her mother died when she was 16 and her father just after she enlisted in Vietnam as a nurse. Her source for family traditions was gone so early in her life that she kind of had to improvise and come up with something new to make the holiday fun for the kids. Every year she would prepare breakfast with as many items she could put green food coloring in. When I would come home from school I could always smell the Corned Beef and Cabbage cooking. Do I like Corned Beef and Cabbage? Not even close, but the taste and smell will always bring me back to my mom. She served it with vinegar, green biscuits many years and sweet iced tea, being that not only was she half Irish, but she was also from the South. There is just something special about the nostalgia that comes from sitting down to a meal you’ve had so many times over. But there is also something exciting that comes from changing those traditions just a little and making it into something new with your own family. I love to cook to celebrate holidays, like my mom, and always look for something new and fun to try. The best kinds of recipes are the ones the littles can help with because you can talk while you cook, teach them a skill and get a wonderful treat out of it! One of my favorite places to get recipe ideas is the blog Oh So Delicioso. They have several recipes for St. Patrick’s Day but by my favorite is the Neon Green Punch since I have small children that love the color! Electric green is a head turner and since it’s not too sweet I don’t have to worry about giving a second glass to my kids. Another one of my favorite sites for recipes is Weelicious as well (you can see the natural green recipes here). I have found that with modern traditions, it’s not necessarily about having the exact same thing each year but that you do something each year so your kids know about the holiday and what fun you can have with it. My kids are all preschool age and younger so the big school parties won’t happen until this coming fall. Until then we have the opportunity to make each holiday unique to us and what we love. Today we are rounding up some of our featured moms for Mom Talk Monday: Christmas Traditions. Every family has traditions they look forward to for the whole month of December. But sometimes adding something new can be fun and inspiring. Katie Lindsay, and her husband set up a fort in their living room with cameo coverings and Christmas lights. Her four boys sleep in it on Christmas Eve while the wait for Santa. Our own Bethany has a tradition that many families do. Her children receive pajamas on Christmas Eve each year, but they come from a few special someones. Santa’s elves leave the pajamas on the front door step and ding dong ditch so they are not seen. Jen Haderlie, the new mom of twin girls, loves to go to Starbucks for a cocoa and driving to see the Christmas lights where she lives. After they get home they read the story of Christ’s birth before going to bed. We hope you take time to make new traditions, while still enjoying the old ones, with your family this holiday. Having a Holiday Movie Night in only takes a small amount of preparation to have an enjoyable evening that you can turn into a yearly tradition. Movie theaters are open on Christmas Day every year with some kind of a holiday show for families. But that also requires getting dressed, getting in the car and spending astronomical prices for popcorn. Besides, who wants to get out of their Christmas pajamas anyway? Why not stay in, stay warm and enjoy your vacation at home? I thought you might agree. -Sleeping bags, blankets and pillows. Enough to fill the floor. 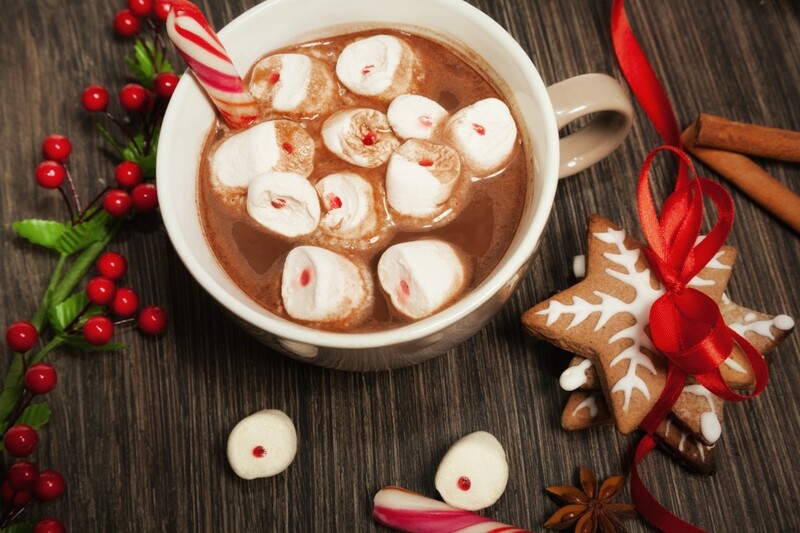 -Hot chocolate bar on the counter with ingredients like: marshmallows, chocolate chips in several flavors, cinnamon sticks, peppermint sticks, flavored coffee creamer, whipped cream and sprinkles. Traditions are part of what we look forward to during the holidays. Being able to share those things we cherish with those we love is a great way to give a gift that has no monetary value. It also shows your children what is so important this time of year, being together and growing as a family, extending the hand of friendship and making bonds. Happy movie night! 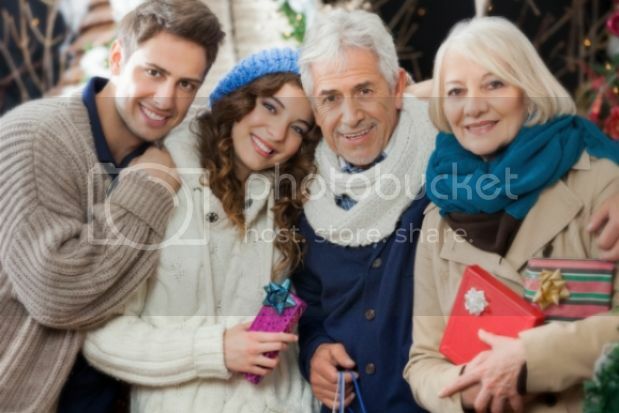 Holiday get-togethers are memory makers. You catch up with family you haven’t seen in some time, eat as if calories don’t count and enjoy the spirit of the season. But some of us have the absolute pleasure of hosting some of that family for multiple days in our homes and the cooking, cleaning and pure joy that comes with it. Today we offer how to entertain guests during the holidays in small ways to make your life a little easier while you host those you love most. While your grocery bill is going to go up, make sure that part of that is easy finger foods and drinks for all the kids that will be constantly asking for a snack, and adults. If your kids are anything like mine, if one asks for something to eat, they all do. Purchasing a large vegetable tray is a great way to go because you can set it out and everyone can take from it as they want. Even if it is in the fridge, everyone can take it out, take a few pieces and put it back. No preparation necessary. Add to it crackers, the mini cheese squares and flavored sparkling water and juice boxes and your all set. Make a meal plan for every meal. Ask guests to contribute to the meals with a side or dessert and then they feel like they have helped in some way and you avoid them potentially offering you money to cover the costs of all the food. Also, clean out your fridge before everyone comes and leave room for your guests to put their own food, especially if they have a special diet. Have activities in mind to go to or do at your home. Bringing out the board games are great, but knowing about special events happening in your area before your guests arrive is nice to choose from to break up the several game nights in a row. Finally, offer those you love a room with a lock on the door. Having some kind of privacy will really help them feel better about staying over instead of a hotel. Knowing you can fully relax while vacationing is a gift in itself. Enjoy your time with family and friends. Here’s to many nights of staying up late, too much cocoa and filling your heart with memories.